Kindness Counts | Who Needs a Nap? Aside from proper hygiene and how to cook dinner for Mommy and Daddy, I believe that one of the most important things to teach our children is to be kind. Kind to each other, kind to others… a little kindness goes a long way and all that… you know? This past December, in an attempt to practice what I preach and teach my children the true meaning of holiday spirit (which we all know is about getting presents, but whatever), I stole borrowed an idea I saw on Pinterest (original source here) and decided to try it with my kids. 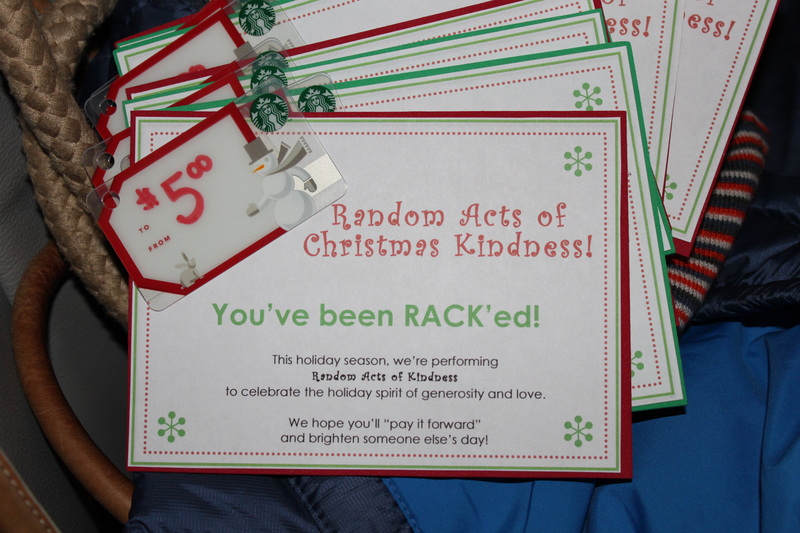 The idea was to practice daily “Random Acts of Christmas Kindness” (or RACKs) for the month of December, hence my calling the experiment, “The 24 Random Acts of Christmas Kindness.” Well. It didn’t go exactly as planned. Clearly, we were in DESPERATE NEED of this project. Understandably, the recipients were a bit confused at first. (Wouldn’t you be if a little miniature person ran up to you, screaming “HAPPY HOLIDAYS! !” and shoved a card in your face?) But then they read the card, looked at me for confirmation that my kids had permission to be giving stuff to strangers (sure!) and then usually reacted very positively. After seeing the happy reactions the first couple of times, the kids were really excited and as soon as we were done, I heard, “That was so fun!” “Let’s do more!” “Can we do this again tomorrow?” Of course, I immediately started drafting the inscription for my “Mother of the Year” plaque. With gritted teeth and my fake-happy falsetto voice (c’mon, you know it well), I gave them a quick reminder about the whole point of this experiment (“We are nice people, dammit!”) and we were off. And it was great. 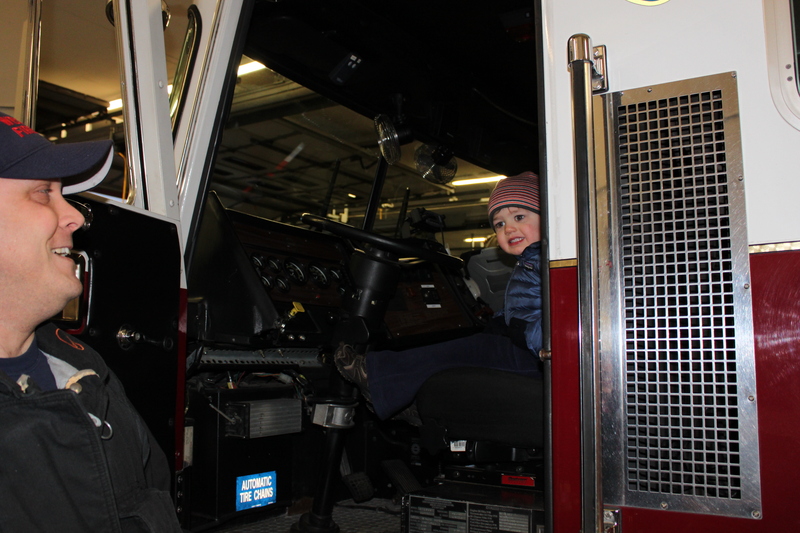 The firefighters and staff there were extremely appreciative AND kind enough to let the kids climb on the truck and pretend to drive. They would ultimately enjoy doing whatever our RACK was for the day, but I started to wonder… either I am pushing this too hard or my two older kids are already a lost cause and I should just focus on the Happy Dude. Either way, by Day 13 my experiment started to fizzle. Why? Partly because it felt like a little bit of a chore to nag my kids about it and that certainly wasn’t the point. Partly because I started running out of ideas that didn’t cost money (and I didn’t want THAT to be the point either). When I started slamming the Starbuck’s door in peoples’ faces because I had already donated books to the Barnes and Noble book drive, I knew it had to end. There I said it. Phew. (This feels like Confession.) Of course, I worried about what message THAT sent to the kids. And then I yelled at myself for worrying too much about every little message I might be sending to the kids. Then I ate 53 holiday cookies and felt much better. Sort of. Seriously, I’ve been a little bit mad at myself ever since December for not following through on a project I felt was important. But I’m writing off 2011 as a learning year. I think this year we’ll do it a little different… maybe we’ll put 15 ideas in a jar to be picked at random OR maybe we’ll just have a discussion at the end of each day about how we practiced kindness that day. Geez, I don’t know. Stop pressuring me. Thankfully, I have eight months to think about it. PS. For those of you wondering, some of our other RACKs included: donating to various fundraising events (from their own piggy banks) as well as toy, book and clothing drives; bringing treats to the cafeteria staff at the Loud One’s school (her idea); secretly leaving bags of candy in our neighbors’ mailboxes; bringing coffee and treats to some workers on our street; leaving candy bars in miscellaneous places around town (store counters, ATMs, etc.). Next year, I’ll be using this site. PPS. We wanted to send a care package to the troops, but by the time we got the address of the soldier we were somewhat connected to, we found out that he was heading home. (Yea!) We put one together anyway and got it out just in time for Valentine’s Day. We ♥ the troops. 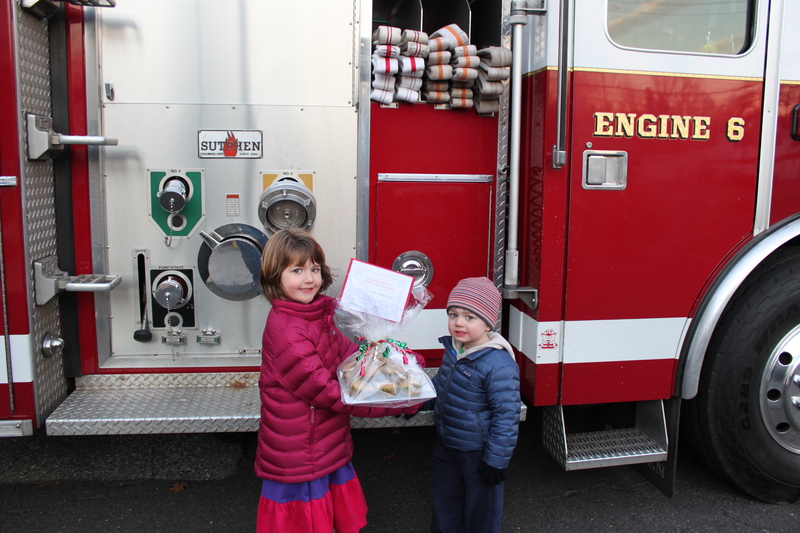 I hope you taught them the most important lesson of all….that firemen are HOT and you should bring them cookies on all occasions, not just xmas. i like this idea alot!!! Sounds like you guys did a wonderful job!!! I agree with lauren and make it random!! I’m going to try to put this into work on those “rainy” days so we can do our share too!!! And the girls have something to do to keep them busy as well!!! this is not a “Reply” to KMAC….if fact, stop reading here if you are KMAC….hey folks, wouldn’t this be a lot better world if more KMAC’s lived in it? Absolutely! I second that. What a great thing to do to help others. Better still, to teach your children the act of kindness. Eventually, they will understand and do it on their own. Keep it going KMAC, you’re doing good! Pingback: Christmas To Dos: Past & Present « Who Needs a Nap? Pingback: Move over, Halloween | Who Needs a Nap?